Is an air fryer the same as a halogen oven? Air fryers are hot, fresh, and the latest product you want in your kitchen. In fact, creating healthy and tasty food never felt easier. But that’s not to say air fryers are the first and only products to accomplish such a feat. The market does offer one strong contender to air fryers. And that competition is none other than the halogen oven. So we’ll jump straight to the point here. What’s better: The air fryer or the halogen oven? Today, let’s explore this question in depth. We’re not pulling any stops here as we examine which kitchen appliance reigns on top. So get your dining table seats ready! The culinary battle of the air fryer vs. the halogen oven is about to be bigger than McGregor vs Mayweather! 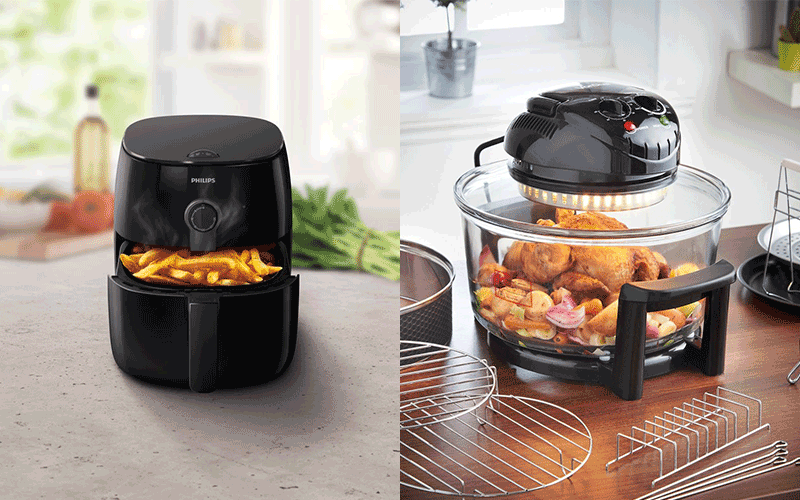 3 Which is Better: The Halogen Oven or the Air Fryer? 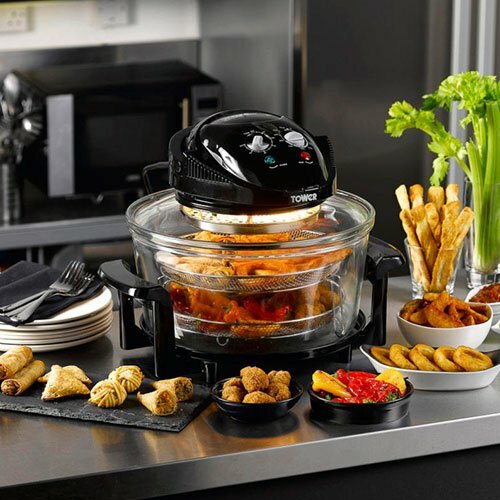 4 Can You Use a Halogen Oven as an Air Fryer? Don’t worry! We’ll get to which is better eventually. But first, we need to take a look at the specs each of these fryers brings to the table (or maybe counter in this case). We’ve got to say, each of these appliances actually does a pretty good job of cooking delicious food. But they do so in pretty different manners. So let’s get this epic food fight started. Let’s kick things off with the halogen oven here. As the name implies, this appliance heats your food with a halogen light bulb. It might not sound like much, but it does a surprisingly good job of heating and outright cooking food. The bulb receives some help from the fan that’s often attached to the lid. This piece allows the heat to spread throughout the container. So you won’t need to frequently flip your foods for a thorough cook. As far as cook times go, you won’t need to wait long for your meals to reach your table. Fully cooking a 1.5kg chicken takes as little as 35 minutes. So how do air fryers compete? The big difference here is that air fryers will heat your food with an electric coil. This wire emits heat, which circulates with a fan. So both of these fryers heat your foods quite differently. But are the times really that different? In short, not really. Air fryers will need about 75 minutes to cook a 3kg chicken. And for a smaller 1kg chicken, expect more in the ballpark of about 20 minutes. So at the end of the day, both of these fryers cook your foods in comparable amounts of time. In fact, the difference is close enough that you probably won’t notice much of a difference. For this category, it’s a pretty close tie as to which will cook your foods more efficiently. Now we’re at a point where you will find some notable differences! Here, halogen ovens outright win the size war as far as sheer volume goes. But at the same time, bigger is not always better. Most halogen ovens range in size from 5-12 litres. This is perfect for cooking larger portions of food. Even better, you won’t need to rip apart your poultry for it all to fit inside this fryer. So far so good. Here’s where size will get you into some trouble. Before getting excited here, first ask yourself how much counter space you can work with. If you’re in a compact studio apartment, it’s tricky enough finding room for your pots and pans, much less bulky appliances. Air fryers on the other hand vary quite a bit in size. Smaller fryers will offer volumes of less than 1 kg. But that’s not your only option. If you like bigger portions, you can easily find air fryers with 7.5-plus litres of space. It’s all dependent on what you’re trying to find. With this in mind, you’ll have no problems finding compact air fryers that can fit in the snuggest of kitchens. Smaller air fryers will usually cover 17 sq cm of counter space. So you won’t struggle too much finding somewhere to place it. For this round, we’ll give halogen ovens the win. But it’s more of a split decision than a game-ending TKO. In all honesty, the compact nature of air fryers will work better for smaller kitchens. So keep this in mind when shopping. Here, it’s another close call. In both cases, you can find digital and analogue formats. As you might have guessed, digital models cost more. But they’re more of a luxury than a necessity. In both cases, you can even find pre-set cook options as well. So with that said, there’s no inherent advantages or disadvantages here. Yes, you read that title right. The lids really do matter here. With halogen ovens, the lids are often removable. On the surface, this doesn’t seem like much of an issue. But you’ll want to remember two things. 1.These lids get hot. You’ll need to be careful not to scald your hands or anything else for that matter. 2.You’ll need to place these lids somewhere when removing or stirring your food. Going back to point number 1, these lids are super hot when they’ve cooked your food. Put in on a wood surface, and the texture will warp. Put it on a counter top, and the result is not pretty. No one likes ugly burn stains. So you’ll need to find special pads or cloths for setting the lid. It goes without saying that a detachable lid leads to more problems than anything else. So how do air fryers respond? In most cases, air fryers offer slide-out baskets as opposed to lids. These baskets also provide handles in the front for easy and safe use. So if you need to shake some fries, you can do that while they remain in the basket. Also, the basket does a great job of easily sliding in and out of the fryer. So this means the basket rarely takes up any excess counter space. With all this said, the lids are outright annoying on halogen ovens. So we’ll give this one to the air fryer. As a whole, both of these fryers are pretty comparable when it comes to their price. Most air fryers will range from £40 to £300. As a rule of thumb, the cost rises with the crazier and more luxurious features. Of course you’re wondering if the higher priced air fryers are worthwhile. But don’t worry, we’ve got all that covered in a different article. As far as halogen ovens go, you’ll notice some slightly cheaper price. In fact, it’s pretty easy to find a lower end halogen oven as cheap as £25. But again, if you want the luxury features, you can pay as high as £300 for them. Health matters. And if you’re looking to cut some calories, air fryers do a great job of that. Since you need fewer oils, it’s easy to cut back on excess calories in an air fryer. And while you’re at it, you can reduce some of your fats as well. Plus, if you’re not a fan of corn or vegetable oil, you’re free to add in some coconut oil, extra virgin olive oil, or ghee. Halogen ovens can cut calories as well. But keep in mind that it’s hard to cut back on as many fats since you’re submerging your foods in most cases. So naturally, your foods will contain more oils when cooked in a halogen oven. Which is Better: The Halogen Oven or the Air Fryer? Now we can get to that big question. As a whole, both of these cookers are worthwhile investments. But we do have a clear winner. On the one hand, halogen ovens will offer you better space for the British pound. But cooking is not all about size. In fact, once you buy enough appliances, you’ll find your space becomes quite limited. So, with this in mind, the air fryer comes out on top. Plus, it’s hard to go wrong with a cooker that can make your favourite foods substantially healthier. And if that’s still not enough, don’t forget that you won’t need to put up with a pesky and annoying lid. Can You Use a Halogen Oven as an Air Fryer? Are you looking to air fry your favourite foods in your halogen oven? Fear not, as you actually can. The process mainly involves buying an air fryer for your cooker. These usually cost around £20, so they’re not huge setbacks to your wallet. Anyway, these pieces look similar to a pan you place in your halogen oven. While cooking your favourite meals, excess oil will drip out of the pan. Thus you’ll consume less fats. Even better, you can use many air fryer recipes here as well. So if you’re looking for a quick air frying fix, these accessories are a great means of doing so. All in all, food is something that all humans need. There’s no arguing that point. But it’s important that you fuel your body properly. And much of this comes from owning the right kitchen appliances. In recent years, the media did a perfect job hyping up air fryers and halogen ovens. And hopefully our kitchen-side analysis helped you make a decision for yourself. At the end of the day, both of these fryers do a fantastic job of cooking healthy-versions of your favourite fried foods. So now, it’s up to you to pick one up and begin a culinary journey.